Development planning, implementation, monitoring and evaluation at national and regional levels assume high significance in contemporary society as they involve economic development, poverty alleviation, social engineering and preservation of quality of life at national and regional levels. Involvement in efficient economic development planning and implementation at various administrative units has been part of state responsibility at varying levels since independence. However, complexities have emerged in the field of planning with the expansion of neoliberal, free market economic ventures initiated and implemented by the private sector-local and foreign – making the process of planning quite challenging. Coordination of planning and implementation activities including budgeting, provision and careful utilisation of resources among various levels of government plays a crucial part in the process. At this juncture, whether Sri Lanka is facing up to this challenge in terms of political, institutional (bureaucratic), and procedural dimensions is a reasonable question to raise. In this regard, gaining an understanding of how the development policy development and planning evolved since independence and acquiring a sense of the challenges facing planners as well as how to address them are necessary steps. This book provides the reader with a useful resource to achieve these objectives. The author who held important positions in the national planning department of the finance ministry and the finance commission responsible for provincial budgets has utilised his academic training as an economist to come up with this publication. He holds a Master’s degree in Regional Development and Planning from the Institute of Social Studies in The Hague, the Netherlands. The book details measures to arrest regional disparities, e.g. local government to be given more responsibilities, better coordination, industries in agriculture areas, focus on vulnerable groups (pp. 64-67). A series of recommendations to address other continuing issues are also included in the final two chapters. There are numerous insights that present day planners and students of development planning can gain by reading the book. Successive governments since independence introduced a number of development plans and policy approaches/frameworks at the national level while a range of development initiatives has been instituted to develop regions and sub-regions. The latter followed policies and strategies adopted at macro level in order to address the regional disparities. In terms of the changes in planning approaches, ‘governments from 1948-1977 accorded a prominent place for economic planning. Governments that came after 1977 adopted a less interventionist liberalised economy approach. They provided policy directions to private investors considered as the engine of growth for viable projects and utility services (p.29). However, compared to other countries in the region such as Thailand, Singapore and Malaysia, Sri Lanka has not performed well in the economic frontier in terms of economic indicators. Aafter analysing socio-economic data, the author states that the objectives and targets set out have not been achieved satisfactorily due to domestic and international factors some of which are beyond the control of relevant authorities (P.81). Since the introduction of Provincial Councils in 1987, national planners had to work with their counterparts at the provinces –both at the political and bureaucratic levels. However, the duplication of development plans by the line ministries and Provincial Councils has emerged as a major issue. Concentration of industrial, commercial and service activities in and around the capital have not changed during the last seven decades either. The book includes chapters that engage with national and regional planning approaches, provincial planning and challenges of development planning. It analyses the planning strategies adopted by governments during the seventy years since 1948 at national and regional levels. Chapter 1 deals with definitional issues and the nature of policies and plans implemented in various periods. Reasons for poor performance are also outlined (pp. 30-31). For the 2015-18 period, planning indicators are given. The government vision is explained as ‘to graduate the economy to an upper-middle income status by 2020’(p.25). In order to achieve this vision, ‘the government adopts an economic strategy based on social market concept with the twin objectives of achieving higher growth and promoting social equity’ (p.25). Developing regional and rural economies through strong small and medium enterprises is part of the policy agenda. Chapter 2 deals with national planning approaches including their theoretical backgrounds such as Classical and Neo classical, Core-periphery, Dependency, and Neo Marxist. The distinction between capitalist and socialist development concepts are elaborated while pointing out that in the 20th century the US and the Soviet Union adopted mixed economy model incorporating elements of both market economy and centralised planning by the state. The details on theory in the chapter remain very basic and descriptive. The author does not engage critically with the theoretical approaches mentioned or their suitability to the Sri Lankan context. However, the chapter provides the reasons for regional disparities and emphasises the need for balanced regional development across provinces (pp. 34, 39-41). The book provides a historical overview of the planning architecture and the global influences while making note of specific policy documents current at each period. The period between 1948-2018 has been divided into nine categories. Under each, the author describes economic plans and programs undertaken by various governments. However, critical evaluation of these policies and plans is absent. Author does not provide a sense of success or failure of various approaches adopted by governments or his own evaluation of each approach. Rather the chapter runs as a descriptive outline, which nonetheless is useful for the reader unfamiliar with the subject and desiring to do further research. Chapter 3 deals with Provincial Councils and planning – an area with relatively less knowledge and understanding in relation to development planning and practice. Since 1987, some legislative, executive and financial functions have been devolved to PCs. The subject of local government institutions came under the supervision of PCs. Annex III provides the list of reserved, provincial and concurrent list of functions. Finance Commission is responsible for working out how to apportion the funds for provinces. The chapter outlines the steps followed in provincial development planning and the distribution of block grants (pp.72-72). Author describes the Results Based Management Approach in contrast to the input-output approach adopted since 2011 with guidance from the Finance Commission. These details are also descriptive and normative. In the summary section, the author highlights how the province rather than the district became the planning region and the role of finance commission in maintaining a sound fiscal relationship between the national government and PCs. He states that the regional disparities have not been minimised even after 30 years-though some improvements can be observed in some socio economic indicators pertaining to education, health, poverty, nutrition, water supply and sanitation (p.77). Importantly, the author makes suggestions for improving regional disparities including the allocation of funds to less developed areas within provinces, ability for the PCs to borrow funds for commercially viable projects as the provinces are not receiving adequate funds from the government (pp.78-80). High recurrent expenditure in the provinces is seen as a drawback. Chapter 4 considers key challenges of development planning in the country (pp.81-88). Among them are the increasing trend of unequal distribution of income and wealth, acute poverty and malnutrition pockets (provides information but no sources are listed), unequal distribution of means of production e.g. land in old colonisation schemes, concentration of economic power in the hands of a few in the business community (upper middle-rich), tax evasion by the rich and upper middle class leading to lack of domestic resources for development, and unemployment and under employment among youths. The last is important as it reflects the non-utilisation of productive labour. Growth of elderly population and the need for rationalising social security system, weak investment by private investors in the productive sector, issues in supply-driven projects in rural areas, waste and corruption in the public sector, bureaucratic bottlenecks in regional and local levels and the lack of popular participation in development planning and implementation are other challenges. Maintaining a balance between politicians, bureaucrats and technocrats in planning and implementation is seen as an important measure for better policy outcomes and to create a conducive environment for private investors. These are useful general propositions that other researchers and policy makers can expand through research and further policy dialogue. Though the author mentions technical sustainability of projects in passing, no concerted effort is made to discuss this subject in depth. The author states that the objectives and targets in relation to national and provincial level development plans and policy frameworks have not been achieved without undertaking a thorough analysis of available data to base such statements. The analysis is very basic and limited to several socio economic indicators. He does not add his own insights gained from extensive experience in the field either. In Chapter 5 devoted to conclusions and recommendations, the author identifies two major issues, 1. Gap between the rich and poor, 2. Disparity between developed and less developed regions. To address these, state intervention is necessary rather than relying on free enterprise dogmatically. He emphasises the need for wider discussion with civil society and other stakeholders but no other measures are conceptualised. Author emphasise the need for a stable and conducive policy regime and direction for the private sector. Among the recommendations (pp. 90-92) are the need for a comprehensive policy review to uncover lessons learned, improving the technical and institutional capacity of planning units in line ministries and PCs, the need for regular dialogue between national and provincial planners, and the need for a training institute for development planners. Weak institutional relationship between Provincial Councils and local government authorities in relation to financial and development matters is identified as a major issue. Several complaints of the LG authorities are also listed, e.g. PCs not giving due consideration to their proposals and insufficient funding. 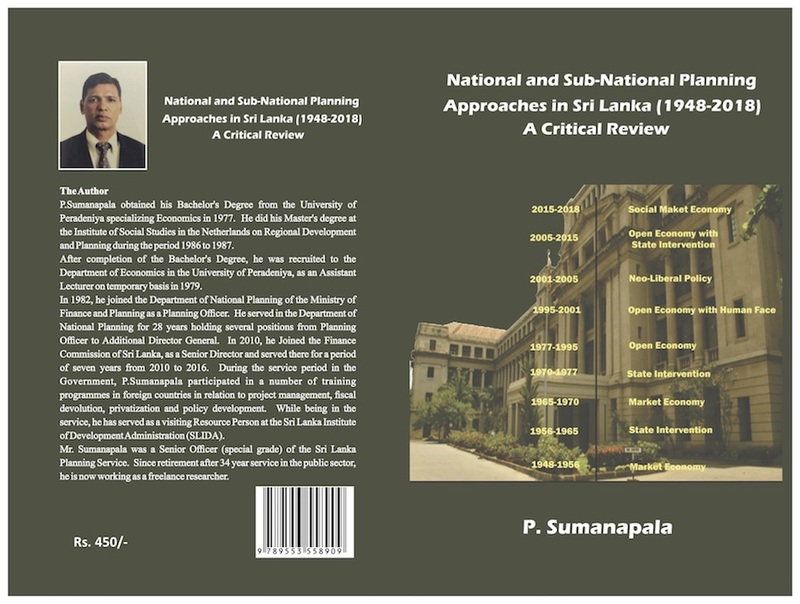 Dr. Siri Gamage reviews the book “National and Sub-National Planning Approaches in Sri Lanka (1948 – 2018)” author P. Sumanapala. (2018 Quality Printers, Homagama). Do not understand why corruption/nepotism/impunity are taboo in academic circles. Siri/Sumanapala say ~ “…..compared to other countries in the region such as Thailand, Singapore and Malaysia, Sri Lanka has not performed well…..”. Singapore is the odd one. We may look at other SE Asian countries Myanmar and Indonesia with Malaysia and Thailand. These countries have religious bigots. Singapore supressed the language/religion-divide urge. 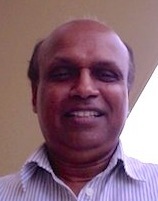 Sumanapala, after analysing socio-economic data, states ~ “……..that the objectives and targets set out have not been achieved satisfactorily due to domestic and international factors…….”. Maybe a bit of international factor. The main one is domestic and is the corruption/nepotism/impunity ogre. Time to take it by the horn. K Pillai, Siri is a top intellectual. I think you are intellect is not that high understand what Prof Siri states. I’m sorry Pillai. Get a PhD and come like Prof Siri. 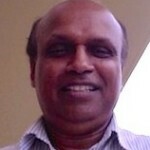 Sumanapala is wrong to say during her time it was ‘Open Economy with Human Face’. Change it to ‘Massive War destroyed economy with zero and negative Economic growth’.